This example of the National Style 1.5 Tricone Resophonic is dated 09-04 (September 2004) and is in overall good condition. 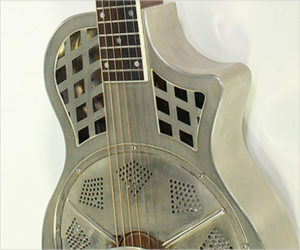 The body is brass with nickel plating and a double-line engraving around the edge (the nickel plating presents a few challenges to capturing an image). Nickel has a tendency to lightly tarnish over time; this is one of the reasons many shifted to Chrome as a longer lasting plating material.